Pretty pictures but recipes are less than awe-inspiring. Readers have abundant choices for vegan cookbooks. Most can be separated into quick and easy or complex and expensive. The Vegan Cookbook falls into the second category. It has mouthwatering pictures of the completed recipes. However, all the recipes include a multitude of ingredients. Many are exotic spices that would be expensive to buy for a single recipe. Several would require a special trip to a health food store or Whole Foods rather than a neighborhood grocery store. It was particularly disappointing to not see any nutritional information—not even calories—for a single recipe. Also there was no indication which allergens were in each recipe without reading the entire ingredient list. A nice soy-free or gluten-free icon would have made it easier for the allergic to find recipes. Usually when I receive a review copy of a cookbook, I prepare at least a few of the recipes. Within The Vegan Cookbook, I couldn’t find a single recipe where I had all the ingredients in my kitchen. I admit that I am not organized enough to add recipe ingredients on my weekly shopping list, bring them home and still feel like cooking the recipe many days later. 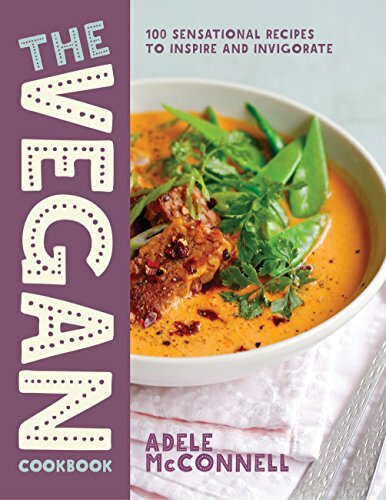 Some readers are and will appreciate the recipes within this vegan cookbook. However, it rates only 3 stars from me. Thanks to the publisher, Nourish, and Netgalley for a review copy.